Only 4 states in Australia run a jeweller’s apprenticeship scheme. Since 2010 cancelling the jewellers apprentice has been on the government’s agenda. 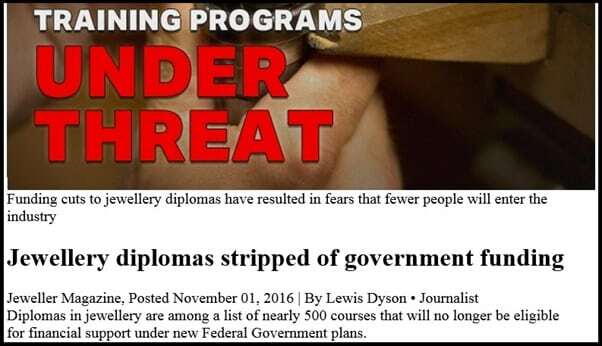 10th of October 2016 jewellery diplomas students were stripped of government funding (along with 477 other courses), few students can afford cost. This was only other major source of funding for the Tafe jewellery workshops. With over 90% of real jewellers workshops closed there are very few apprentices, Tafe’s have even been combining different apprentice years into one class. But now with such little use of Tafe workshops the argument to close these and cancel the jeweller apprentice’s scheme just got a lot stronger. Pic 1. Report of government’s announcement on the 10.10.16 to cancel jewellery diplomas funding. Since the 70’s jewellery resellers tried to look like real jewellers, often claiming to have workshops and jewellers, some sales people became good a faking bring a jeweller, it worked and fake jewellers vastly outnumber real jewellers. See Buyer Beware- Fake jewellers, what are you really buying. The continuing rise of Chain stores, Buying groups and Company jewellers (often with several brands and many bought out independents, some own over 160 shops). CAD (computer aided design) meant jewellers were not required anymore, even for custom made. The internet has bought into everyone homes the scams, which in the past only affected tourist. For certain dealers it’s awesome they clear goods rejected by the industry at top dollar. Today about 99% of jewellery is factory made in Asia (mostly China and India). Since 2000 the majority of high end, exclusive and designer jewellers have turned to these factories make most or all their stock and custom made. We have seen dozens unethical ways they save costs, some only save $1 – $2 but caused a $12,000 ring to continually crack and crumble. Many others can save 30% – 90%. 2 rings stamped 18ct but were only 6ct gold (see Buyer beware – Under carat gold). Few ethical jeweller can compete, many have closed or sold up. Others turned away from quality for the enticing profits and an alternative to closure. The irony is today before writing this I had an e-mail from a young person wishing to know how to become a jeweller. Ringleaders has had many apprentices over the years, but it takes years for each ones and we receive dozens of request each year.